Every year the MG Vintage Racers designate one vintage race as their ?Focus Event? where they have their annual gathering and get an all MG race included. For 2009 it was at Virginia International Raceway in SVRA?s ?Heacock Classic Gold Cup? races this June where 66 MGs showed up to race. For the first time, a new award was presented in the all MG race ? an award to the MG race winner. Up until now, all MGVR awards have been ?spirit awards?. This new award will be an annual presentation at MGVR?s designated ?Focus Event?. It was donated by one of the MG racers and is named the ?MG V-8 Challenge Trophy?. Whatever MG driver wins the scratch race, regardless of the type of MG they are racing, is its winner. 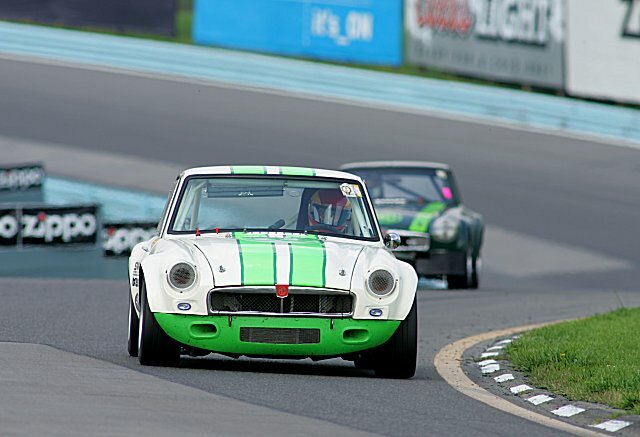 The inaugural honors go to MGB-GT V8 racer Les Gonda of Keswick, Virginia. And don?t think that this was any piece of cake for Les, and you would be surprised at who was hot on his tail! In Les?s own words: ?I am not fast. My car is fast? It will make up for a multitude of errors. Butch McKenzie is fast (MGB). With a 100 less horses he finished the race less than 1.5 seconds behind me and Kent Prather (MGA). Best lap time in a MGA was less than half a second slower than my best! (and that?s on a 3.27 mile course!) These guys have talent! Jerry Richards (also a B-V8 racer) and I have been talking to anyone who would listen, about the MGB-GT V8? for years. They are great cars! Fast, dependable, fun to race and best of all, they beat Porsches! Congratulations to Les, but next year who knows who might win it ? and what model MG they might be racing! The MG racing legacy lives! - These photos attached for possible use with this article (high-res available upon request). - This Press Release may be edited to suit publisher?s needs. - This Press Release also available in Microsoft Word on request. "The Past Racing Into The Future ? MGVR"